The preservation of fish has been an integral part of every seafaring culture. Over the course of thousands of years of drying, salting, and smoking fish the technique has developed to a point where once common food has become a delicacy. In this article, let's look at hot smoked fish. Cold smoking requires temperatures below 80 degrees F/25 degrees C for several days. Hot smoking, however, can be done at temperatures of up to 250 degrees F/120 degrees C and only takes a few hours. It is best to start with a saltwater brine. The brining process is quick so don't worry about having to start out the day before. Plan on the fish being in the brine for about 15 minutes per 1/2 inch of thickness. Also, plan on 1 quart of brine per pound of fish. Hot smoking can be done in almost any grill or smoker and is easier and quicker than cold smoking, which may require more specialized equipment and a lot more patience. What we get is equally smokey, but isn't dried or preserved in the same way. This does mean that hot smoked fish has a short shelf life and needs to be refrigerated or frozen. The brine can be simply salt and water. Plan on 1 tablespoon/15 mL of plain salt, meaning salt without iodine, per cup of water. If you want to use tap water, let it sit in a large container without a lid to let the chlorine dissipate. The brine can also contain whatever seasonings you choose to add. You can replace some of the water with white wine, or you can add peppercorns, brown sugar, or any seasoning that you like with fish. Any fish will work. However, fattier fish will absorb more smoke flavor, so fish such as salmon and trout are perfect for smoking. You can use whole fish or parts, but fillets with the skin still on are better than other cuts. Almost any kind of wood will work, but you might wish to use woods like alder or fruit woods. Salmon is often smoked with alder, as this is a tradition that dates back to the indigenous peoples of the northwestern United States. Of course, you can use mesquite, oak or whatever your favorite smoke maker is. Because of the short smoke times, Mesquite will not have a chance to impart too bitter of a taste, but you may want to use it sparingly. If you can maintain a low smoking temperature, below 150 degrees F/65 degrees C for the first hour or two, then the fish will have more time to absorb smoke flavor. Turn up the heat after 2 hours to around 200 degrees F/95 degrees C to finish it off. Make sure that the fish is heated all the way through to at least 165 degrees F/75 degrees C Remember when it comes to low temperature cooking it is always better to be safe than sorry. On a final note, I would like to point out that not only does smoked fish make a great meal or appetizer, it also makes a great ingredient. Try taking the meat from a smoked trout or similar fish and blend it together with some cream cheese, garlic, salt and pepper and you suddenly have a great spread for crackers. 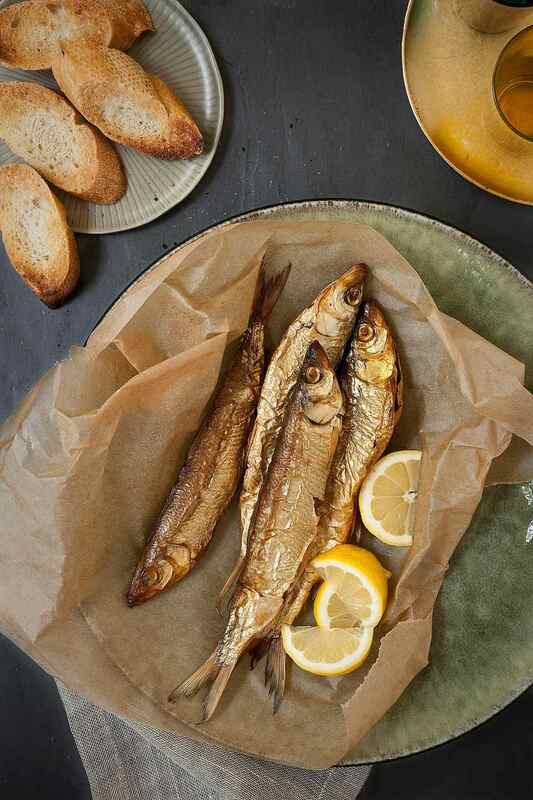 Many recipes call for smoked fish, from soups to salads to main courses. With the knowledge of fish smoking under your belt, you will be able to make these dishes even better with home smoked fish.